SolIPAdapterAddressesWatcher is a Windows GUI tool to watch IPAdapterAddress changes.See Figure 1. 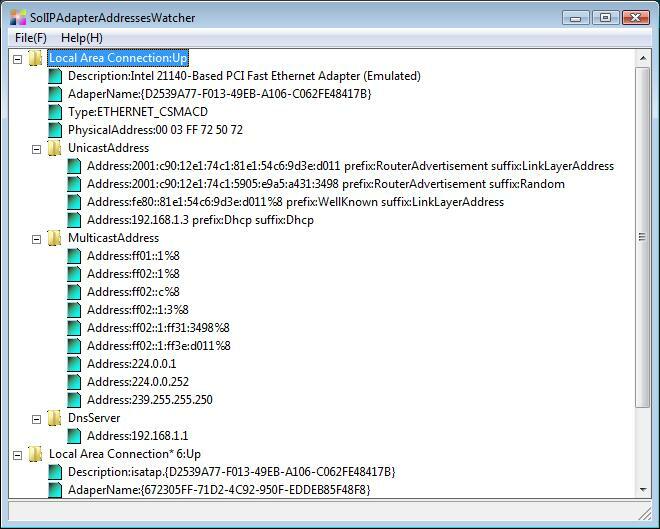 The Windows IP Helper API 'NotifyAddrChange' is used to watch changes of IPAdapterAddresses. This is a very simple GUI version of the Windows command line tool 'ipconfig.exe'. 2009/09/07: Modified to show folder and string icons for items of the treeview.